Bout sheet update will be out soon. 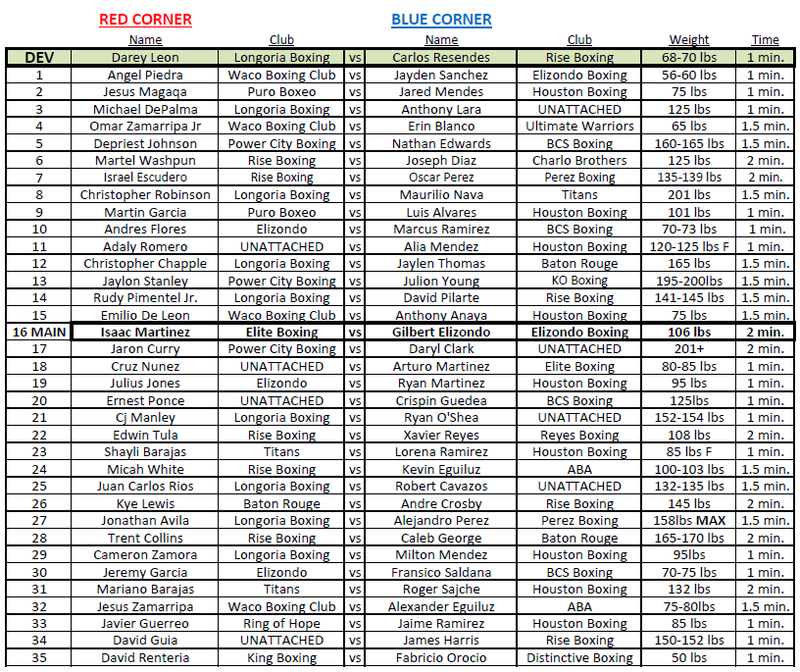 Some bouts moved up or down and some have been added or dropped. DEV	Darey Leon	Longoria Boxing	vs	Carlos Resendes	Rise Boxing	68-70 lbs	1 min. 1	Angel Piedra	Waco Boxing Club	vs	Jayden Sanchez	Elizondo Boxing	56-60 lbs	1 min. 2	Jesus Magaqa	Puro Boxeo	vs	Jared Mendes	Houston Boxing	75 lbs	1 min. 3	Michael DePalma	Longoria Boxing	vs	Anthony Lara	UNATTACHED	125 lbs	1 min. 4	Omar Zamarripa Jr	Waco Boxing Club	vs	Erin Blanco	Ultimate Warriors	65 lbs	1.5 min. 5	TBD	vs	Nathan Edwards	BCS Boxing	160-165 lbs	1.5 min. 6	Martel Waspun	Rise Boxing	vs	Joseph Diaz	Charlo Brothers	125 lbs	2 min. 7	Israel Escudero	Rise Boxing	vs	Oscar Perez	Perez Boxing	135-139 lbs	2 min. 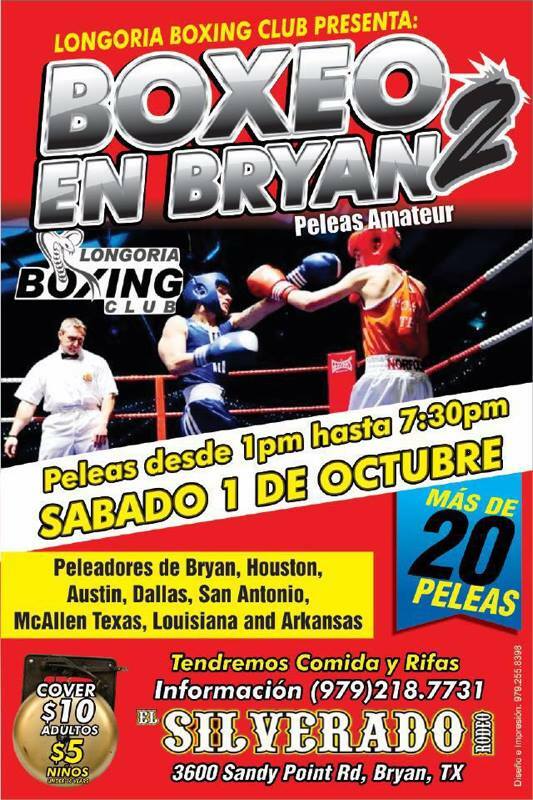 8	Christopher Robinson	Longoria Boxing	vs	Maurilio Nava	Titans	201 lbs	1.5 min. 9	Martin Garcia	Puro Boxeo	vs	Luis Alvares	Houston Boxing	101 lbs	1 min. 10	Andres Flores	Elizondo	vs	Marcus Ramirez	BCS Boxing	70-73 lbs	1 min. 11	Adaly Romero	UNATTACHED	vs	Alia Mendez	Houston Boxing	120-125 lbs	1 min. 12	Christopher Chapple	Longoria Boxing	vs	Jaylen Thomas	Baton Rouge	165 lbs	1.5 min. 13	Jaylon Stanley	Power City Boxing	vs	Julion Young	KO Boxing	195-200lbs	1.5 min. 14	Rudy Pimentel Jr.	Longoria Boxing	vs	David Pilarte	Rise Boxing	141-145 lbs	1.5 min. 15	Emilio De Leon	Waco Boxing Club	vs	Anthony Anaya	Houston Boxing	75 lbs	1.5 min. 16 MAIN	Isaac Martinez	Elite Boxing	vs	Gilbert Elizondo	Elizondo Boxing	106 lbs	2 min. 17	Jaron Curry	Power City Boxing	vs	Daryl Clark	Mo City Boxing	201+	2 min. 18	Cruz Nunez	UNATTACHED	vs	Lolo Martinez	Elite Boxing	80-85 lbs	1 min. 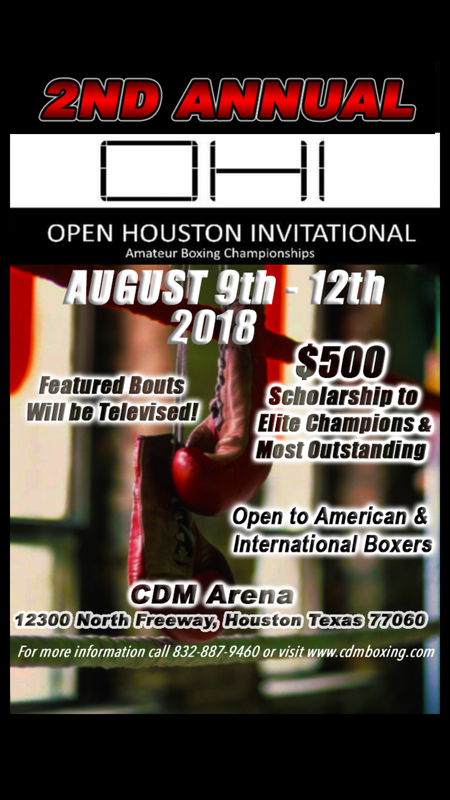 19	Julius Jones	Elizondo	vs	Ryan Martinez	Houston Boxing	95 lbs	1 min. 20	Ernest Ponce	UNATTACHED	vs	Crispin Guedea	BCS Boxing	125lbs	1 min. 21	Cj Manley	Longoria Boxing	vs	Ryan Oshea	UNATTACHED	152-154 lbs	1 min. 22	Edwin Tula	Rise Boxing	vs	Xavier Reyes	Reyes Boxing	108 lbs	2 min. 23	Shayli Barajas	Titans	vs	Lorena Ramirez	Houston Boxing	85 lbs	1 min. 24	Micah White	Rise Boxing	vs	Kevin Eguiluz	ABA	100-103 lbs	1.5 min. 25	Juan Carlos Rios	Longoria Boxing	vs	Robert Cavazos	UNATTACHED	132-135 lbs	1.5 min. 26	Kye Lewis	Baton Rouge	vs	Andre Crosby	Rise Boxing	145 lbs	2 min. 27	Jonathan Avila	Longoria Boxing	vs	Alejandro Perez	Perez Boxing	158lbs MAX	1.5 min. 28	Trent Collins	Rise Boxing	vs	Caleb George	Baton Rouge	165-170 lbs	2 min. 29	Cameron Zamora	Longoria Boxing	vs	Milton Mendez	Houston Boxing	95lbs	1 min. 30	Jeremy Garcia	Elizondo	vs	Fransico Saldana	BCS Boxing	70-75 lbs	1 min. 31	Mariano Barajas	Titans	vs	Roger Zajache	Houston Boxing	132 lbs	2 min. 32	Jesus Zamarripa	Waco Boxing Club	vs	Alexander Eguiluz	ABA	75-80lbs	1.5 min. 33	Javier Guerreo	Ring of Hope	vs	Jaime Ramirez	Houston Boxing	85 lbs	1 min. 34	David Guia	UNATTACHED	vs	TBD	152 lbs	1.5 min. 35	David Renteria	King Boxing	vs	Fabricio Orocio	Distinctive Boxing	50 lbs	1 min. Looking to match Jeff Babyface Willliams 165/34/3 fights Contact: Coach Vince 832-272-8879 call or text!!! Updates Bout Sheet for October 1, 2016. Still have some room for a few more bouts. 3	Martin Alison	KO Factory	vs	Kye Lewis	Baton Rouge	152 lbs	1.5 min. 5	Depriest Johnson	Power City Boxing	vs	Nathan Edwards	BCS Boxing	160-165 lbs	1.5 min. 7	TBD	vs	Seth Sugar McGee	BCS Boxing	135-139 lbs	2 min. 13	Jaylon Stanley	Power City Boxing	vs	Julian Young	KO Boxing	195-200lbs	1.5 min. 14	TBD	vs	Aliyah Pequeno	Elite Boxing	112-115 lbs	1 min. 18	Thomas Lopez	KO Factory	vs	Lolo Martinez	Elite Boxing	80-85 lbs	1.5 min. 26	Deville Alexander	Elite Boxing	vs	Andre Crosby	Rise Boxing	145 lbs	2 min. IF YOUR BOXER IN NOT COMPETING PLEASE DO NOT SEND ME THEIR INFORMATION!!!! I have the following fighters up for anyone wanting to prematch for this show. Contact me at 936-648-1047. 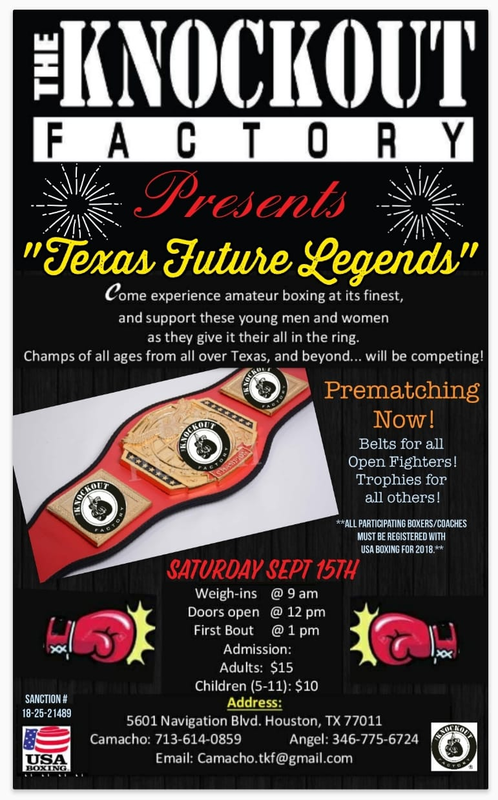 Panterita Boxing has withdrawn from this event. 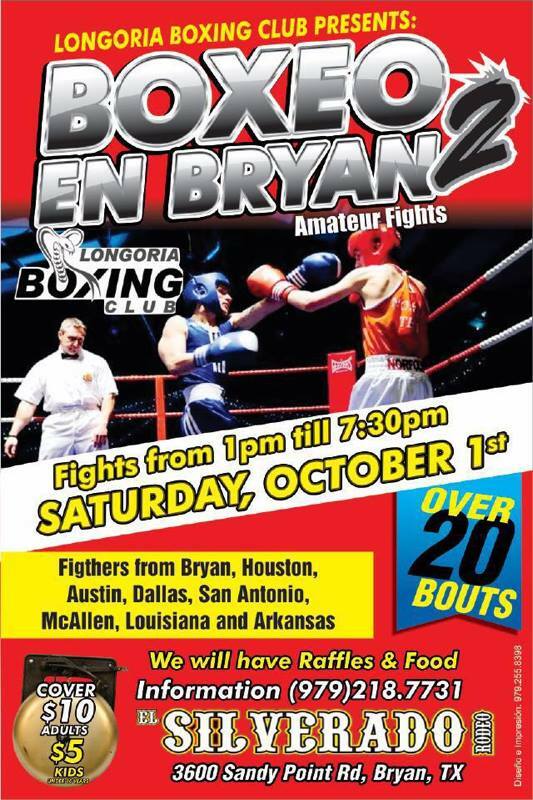 Hilton College Station is a proud sponsor of Boxeo En Bryan 2. Reserve your rooms today, rooms start at $45/night. Contact Virgil Garcia at 979-694-4912. This is what we have so far. Please check names, gyms, times and any other information. Text me at 979-218-7731 for questions or changes. Bout sheet is filling up so call in your bouts ASAP. 2	Jesus Magaqa Puro Boxeo	vs	Jared Mendes	Houston Boxing	75 lbs	1 min. 5	Martel Waspun	Rise Boxing	vs	Joseph Diaz	Charlo Brothers	125 lbs	2 min. 6	Christopher Robinson Longoria	vs	Maurilio Nava	Titans	201 lbs	1.5 min. 7	Martin Garcia	Puro Boxeo	vs	Luis Alvares	Houston Boxing	101 lbs	1 min. 8	Eliel Herrera	PBC	vs	Marcus Ramirez	BCS Boxing	70 lbs	1 min. 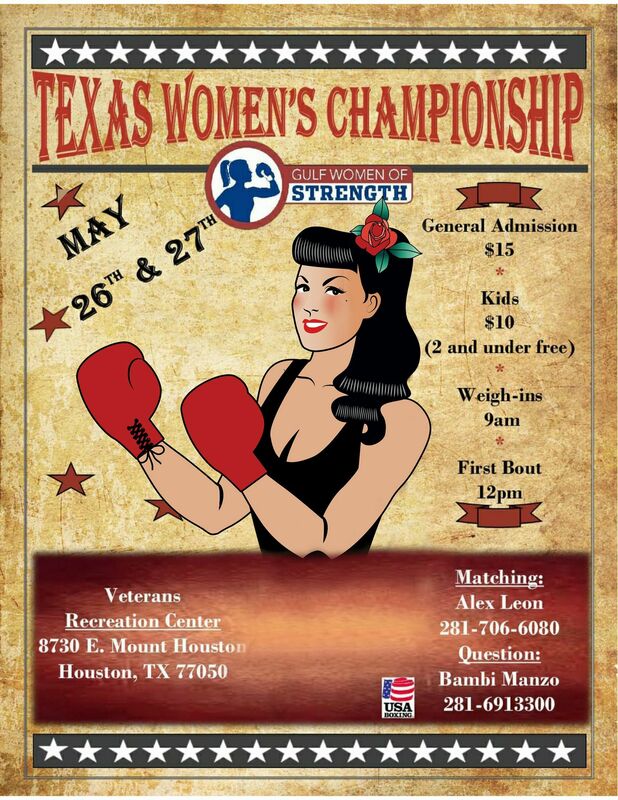 9	Adaly Romero	UNATTACHED	vs	Alia Mendez	Houston Boxing	120-125 lbs	1 min. 10	Christopher Chapple	Longoria	vs	Jaylen Thomas	Baton Rouge	165 lbs	1.5 min. 11	Jaylon Stanley	UNATTACHED vs	Julian Young	KO Boxing	195-200lbs	1.5 min. 12	Donna Aviles	PBC	vs	Aliyah Pequeno	Elite Boxing	112-115 lbs	1 min. 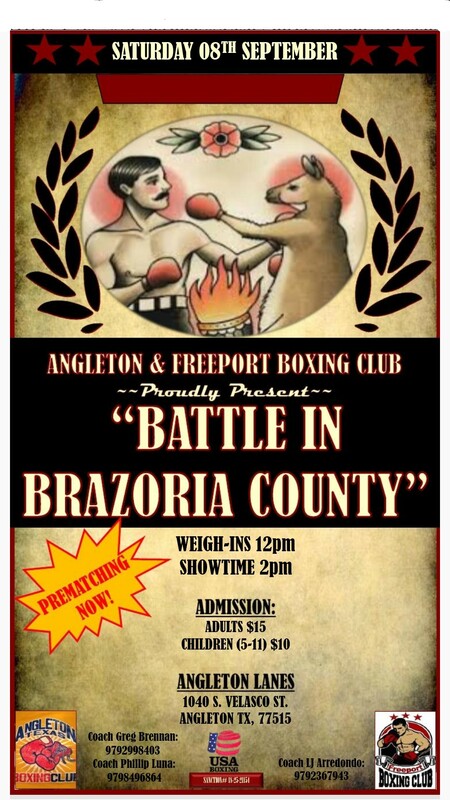 13	Emilio De Leon	Waco Boxing Club	vs	Anthony Anaya	Houston Boxing	75 lbs	1.5 min. 14	Isaac Martinez	Elite Boxing	vs	Gilbert Elizondo	Elizondo Boxing	106 lbs	2 min. 15	Jaron Curry	UNATTACHED	vs	Daryl Clark	Mo City Boxing 201+ 2 min. 16	Thomas Lopez	KO Factory	vs	Lolo Martinez	Elite Boxing	80-85 lbs	1.5 min. 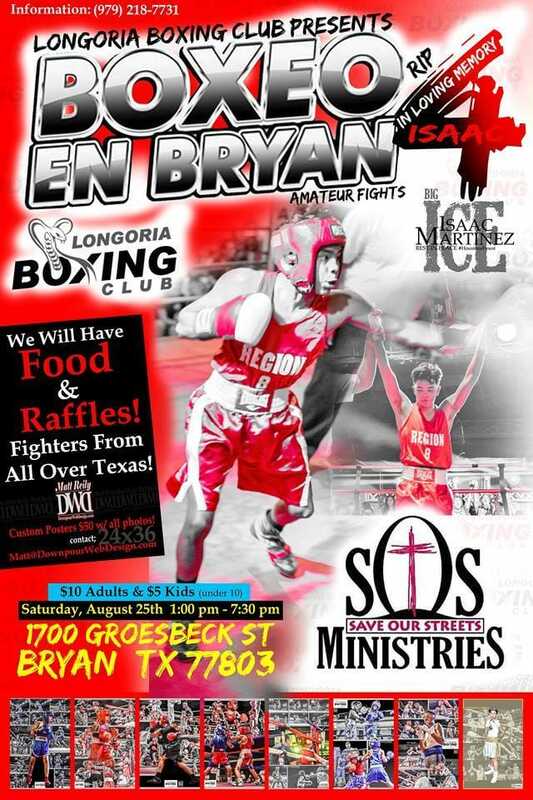 17	Julius Jones	Elizondo	vs	Ryan Martinez	Houston Boxing	95 lbs	1 min. 18	Ernest Ponce	UNATTACHED	vs	Crispin Guedea	BCS Boxing	125lbs	1 min. 19	Cj Manley	Longoria Boxing	vs	Ryan Oshea	UNATTACHED	152-154 lbs	1 min. 22	Juan Carlos Rios	Longoria Boxing	vs	Robert Cavazos	UNATTACHED	132-135 lbs	1.5 min. or contact boxers gym for Pre-matching. Starting to fill up, first come first serve. Looking to pre-match Jeff Babyface Williams Contact 832-272-8879 call or text!!!!! 165/34/3 fights!! !